As Ugandan folk musician Haruna Walusimbi states in the film: “There is this negative thinking about Africa. There is nothing good in Africa. They are beggars, there is HIV/AIDS, they are at war all the time. But that is just a very small bit of what Africa is.” Béla’s trip provides a glimpse into the incredibly rich and diverse musical traditions of Africa. At first glance, it might seem odd that the banjo is the catalyst for this journey. But in fact, the banjo is originally an African instrument. And Béla Fleck’s passion for the banjo runs deep. In his trailblazing 30-year career, Béla has brought the instrument into jazz, pop, classical, and world music settings, and won eight Grammys along the way (not to mention the 20 nominations, in more distinct categories than anyone else, ever). Ever since he started playing music, Béla heard stories about where the banjo came from. To many, the banjo is seen as a uniquely American instrument – and even conjures images of white Southern stereotypes. But the banjo is actually a descendant of an African instrument. West Africans have long played an instrument that looks and sounds much like the banjo. When slave traders captured West Africans, many of the slaves brought that instrument, and the knowledge of how to make it, to the United States. On plantations in the American South, slaves were not allowed to play drums, but they were allowed to play the banjo. Soon, whites started copying it, and the banjo evolved into the instrument we know today – and became a part of American culture. Béla wanted to go to Africa to trace the roots of the banjo, the instrument that defines who he is. But Béla’s journey was also motivated by a deep love of African music. Béla was inspired by music from all across the continent, and very often he could hear a place for his banjo. 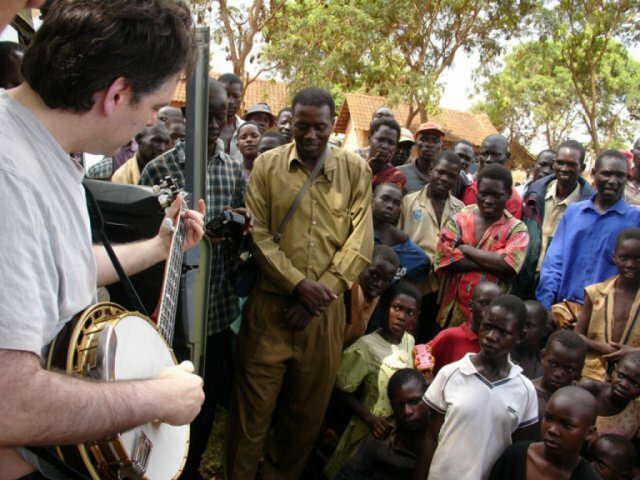 When Béla had a year off from his band, Béla Fleck and the Flecktones, he realized it was the perfect opportunity to follow his dream – travel to Africa to collaborate with African musicians. “Throw Down Your Heart” is a feature documentary that follows Béla’s musical adventures through four African countries: Uganda, Tanzania, The Gambia, and Mali. Along the way, he works with a wide array of musicians – from local villagers who play a twelve-foot xylophone, to a family that makes and plays the akonting (thought by many to be the original banjo), to international superstars such as the Malian diva Oumou Sangare. As Béla travels across Africa, he forges both musical and personal connections. Using his banjo, he transcends barriers of language and culture, finding common ground with musicians from very different backgrounds and creating some of the most meaningful music of his career.